Andy Peaks believes the Evo-Stik Southern League Division One Central will get the play-off final it deserves when AFC Rushden & Diamonds go to St Ives Town on Monday. The two clubs topped the attendance charts during the regular campaign with Diamonds averaging 457 for their matches at the Dog & Duck while St Ives had an average of 283 for their home games. The Saints finished fourth, just above Diamonds, meaning they will have home advantage for the bank holiday showdown when a place in next season’s Premier Division will be on the line. 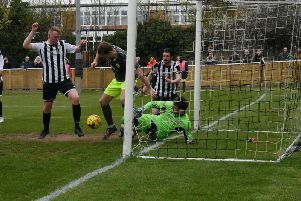 Diamonds were backed by a large and vocal army of fans as they claimed a superb 2-1 success at Royston Town in the semi-final last Tuesday. Peaks knows that will be the case again at ProEdge Westwood Road and, after Diamonds claimed four points off St Ives during the regular campaign, he believes there will be more expectation on his team than there was at Royston. “I think it’s a good final for the league, we are the two best supported teams,” the Diamonds boss said. “The backing we received at Royston was fantastic and that definitely helped galvanise the players. “I would say the expectation has come back on us a little bit more. “They finished just above us but we beat them and drew with them in the two matches we had. “But that counts for nothing, they were two close games and we know a lot of their players and they know us pretty well. Peaks looks set to have a fully-fit squad to choose from, although influential winger Claudiu Hoban will miss out after he was sent off for two bookable offences towards the end of the semi-final success. “Everyone came through Tuesday fine so, aside from Claudiu, we should have a pretty much full-strength squad to choose from,” the Diamonds boss added. “It’s a big blow to lose Claudiu. He has been a massive part of what we have done. “There have been plenty of people who have questioned his work-rate but I think he has quashed all that with the performances he has put in.